Both Carlos Camacho and Grant Grauf will be graduating from JPII this year. 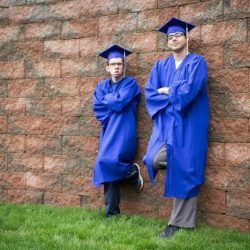 SHILLINGTON – On Monday, June 4, two students will graduate from John Paul II Center for Special Learning (in the multi-purpose room). Carlos Camacho and Grant Grauf are both looking forward what lies ahead. Grant (son of Heather and Richard Grauf) first came to JPII at the age of three! Throughout his time at school, Grant’s favorite subjects have been history and religion. After graduation, Grant plans to attend JPII’s Adult Program and will also work at his family’s bingo hall. John Paul II Center’s graduation ceremony will be held at the school and will include a Mass. Both are open to the public. Everyone has a purpose in life. As a values-based organization, John Paul II Center for Special Learning encourages children and adults with intellectual and developmental disabilities to explore their purpose and reach for goals through unique special education and social programming. Students ages three to 21 are able to learn and grow throughout our School-Age Program, with the later years focusing on transition and life skills. We know stability and continuity are important to those with special needs, so we’ve made transition as seamless as possible. After graduation, students may have the option to move directly to our 21+ Adult Program, giving them the opportunity to continue developing skills while making individual needs a priority. Like everyone else, people with disabilities have the capacity to make significant contributions to the community and to the world by utilizing their God-given talents. We’re here to help them along the way.